This hotel is located in the heart of the village of Arinsal in front of the gondola lift and Vallnord Bike Park, and near the mountain roads. The nearest links to the public transport network are right on the hotel's doorstep and guests will find the closest restaurants, bars, nightspots and shops just 50 m away. Andorra La Vella is 9 km away. This charming mountain hotel offers guests direct access to the cable car which rises up to the Vallnord ski resort, making it the ideal Pyrenees slope. Renovated in 2009, this ski resort hotel comprises a total of 27 rooms and is built in the typical stone and wood style of a mountain lodge. During the winter season guests will appreciate facilities such as ski lockers, and in summer they can explore the wonderful green landscape which surrounds the village. Visitors can finish the day with a relaxing drink in the welcoming bar or enjoy a meal in the on-site restaurant. Further facilities on offer to guests include a lobby area with a 24-hour reception and check-out service, a hotel safe and lift access. Guests have Internet access at their disposal and they can also take advantage of the room service. Parking is available for those arriving by car. All standard rooms enjoy mountain views. They come with a private bathroom with a hairdryer and offer 2 single beds. They are equipped with a telephone, a TV, Internet access, a safe and centrally regulated heating. With a stay at Hotel Comapedrosa in Arinsal, you'll be on the riverwalk, within a 15-minute drive of Caldea Spa and Coma Pedrosa. 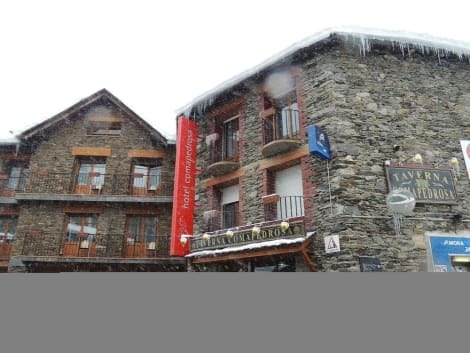 This ski hotel is 6.1 mi (9.8 km) from Pyrenees Andorra Shopping Centre and 15.4 mi (24.8 km) from Naturlandia. Make yourself at home in one of the 24 guestrooms. Dial-up Internet access (surcharge) keeps you connected, and digital programming is available for your entertainment. Bathrooms have bathtubs and hair dryers. Conveniences include phones, as well as safes and desks. Stay in one of 52 guestrooms featuring LED televisions. Complimentary wireless Internet access keeps you connected, and satellite programming is available for your entertainment. Private bathrooms with bathtubs or showers feature complimentary toiletries and bidets. Conveniences include phones, as well as safes and desks.